Weds 2nd – 9th – 16th – 23rd August 1:00pm – 2:00pm. In much of the performative, experience lead work created today, the formal boundaries of genre and form are falling away to reveal new disciplines of practice that aim to immerse and involve the audience in more and more increasingly indefinable ways. But how does the artist maintain a sense of purpose and shape to their making in the face of such a mongrel, nebulous prospect? Peter will explore how his background has aided him thus far in his attempts to maintain this individuality through his particular working practice, and to talk about whether or not any of this is possible at all. Peter Power is a Composer, Sound Designer and Director from Waterford based in Cork. He is currently embarking on a new experimental residency with the National Sculpture Factory of Ireland supported by the Arts Council of Ireland. This residency will explore the intersections of Visual Arts and Composition, culminating in a 10-piece modular work entitled Versations in 2018. Peter holds a degree in Biochemistry and a Masters in Composition from University College Cork. Weds 9th – Michael Waldron – Deep Mapping the West Cork Coast Across the Disciplines. Michael will reflect on the methods employed and challenges faced by the interdisciplinary project team in using digital mapping tools and conducting complex multidisciplinary research in deep mapping the West Cork coast. Deep Maps: West Cork Coastal Cultures is an interdisciplinary UCC project which investigates the biological, cultural, and historical context of the southwest coast of Ireland from 1700 to 1920. Led by Prof Claire Connolly and Dr Rob McAllen, the project seeks to advance a deeper and more holistic understanding of this coastline through a blending of disciplinary approaches. Deep Maps reconnects the Humanities (literature, art history, history, archaeology) and Sciences (marine biology, environmental policy) by way of Geographic Information Systems (GIS) and digital curation. Dr Michael Waldron is a curator and art historian. He holds a PhD from University College Cork and his research and teaching focuses on the intersection between literature and the visual arts. He has published on cybergogy and Irish art and was co-investigator of The Samuel Forde Project (2012-14), co-curator of Samuel Forde: Visions of Tragedy (2014) and The Crawford at the Castle (2016-17), and curator of What’s the Story? (2017-18) at Crawford Art Gallery. He is a research assistant for Deep Maps: West Cork Coastal Cultures. Weds 16th – Sara Baume – Autobiography of a Practice. In the last couple of years, my finished pieces are as likely to be stories, essays and novels as they are to be dollhouses, figurines and model railways. In several short ‘chapters’, I will ponder aloud the pervasive interests, control issues and isolation strategies from which my daily practices arise. Sara Baume was trained first as a sculptor – and then, a creative writing – department. Her debut novel, Spill Simmer Falter Wither won the Rooney Prize for Irish Literature and the Geoffrey Faber Memorial Prize, and is currently being translated into ten different languages. Her second novel, A Line Made by Walking, was published in spring 2017. Weds 23rd – Joanne Power – I think we are just at the beginning. Is it limiting to think of people in disciplines, should we instead start to think of their capacities and how they transform? From a reflective look at her practice Joanne’s contribution will demonstrate the need for inquiry in all its undisclosed and naive form to be deeply rooted in why, and what, we produce. How using a synthesis of approaches to create a unity of practical and intellectual frameworks beyond the disciplinary perspectives broaden our understanding about the changing expanding role and responsibility of the artist, and the possible reconceptualisation of practice and education. Joanne is artist/designer interested in developing alternative design processes and solutions by embracing the exploration of possibilities and ideas through experimentation, the final context of the work is realised through this exploration, largely within the context of sculpture, installation, architecture, concepts and products. Her work could be seen as ongoing research, informed by the worlds of art, architecture, philosophy and natural science. I am interested in our interconnectedness, transformation and constant flux, and how moving away from dualistic systems of thought to a more sinuous way of reflection is both necessary and appropriate. Joanne is a trained womenswear designer with studio experience in Ireland, Antwerp and London. Her work has been featured in Vogue Russia, Neo2, The Times, Image and Tatler magazine and requested nationally and internationally notably, Lady Gaga, Sarah Jane Crawford and Gemma Cairney. She has also made appearances on BBC Radio 4, Canalplus.Fr, Off the Rails, Ireland AM and the Late Late Show. She has presented her current work across the arts, design industry, and architectural academia. 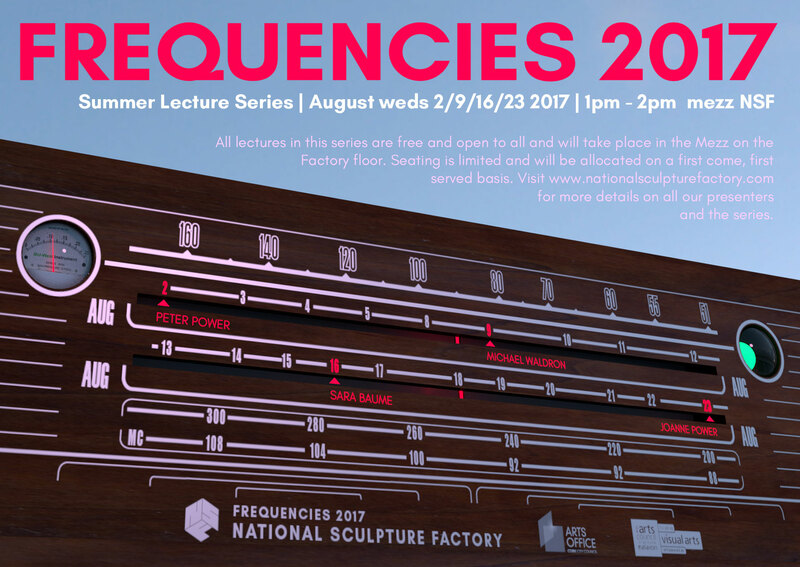 All lectures in this series are free and open to all and will take place in the Mezz on the Factory floor. Seating is limited and will be allocated on a first come, first served basis.